Clack Filter-Ag Plus is a unique natural ore called clinoptilolite that has many outstanding advantages over common granular filter sands and multimedia used for suspended solids reduction. Viewed under an electron scanning microscope, the granules reveal an angular shape, rough surface and microporous void spaces as small as 3 microns. This creates a surface area over 100 times greater than silica sand. The angularity of the granules and the tapered internal pore spaces allow for reduction of dirt, silt and organic matter suspended in water by bridging, straining and adhesion. The rough surface and internal porosity provide a high surface area for efficient reduction of suspended matter. Utilizing deep bed filtration can typically reduce suspended solids down to the 5 micron or less range. 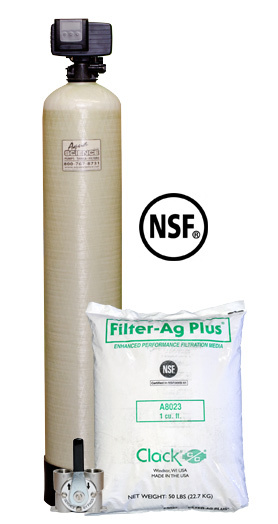 Filter-Ag Plus’ structure typically creates less pressure loss through the filter and allows deeper sediment penetration into the bed for higher sediment loading and longer filter runs. The deep bed filtration capacity of Filter-Ag Plus prevents a rapid buildup of head loss and blinding problems that are associated with typical sand filters. The longer filter run times reduce backwash frequency, which provides conservation of water. This ideal combination of particle shape, texture and porosity make it a good choice where quality water filtration and water conservation are important. Substantial savings can be realized when designing a system using Clack Filter-Ag Plus. Its low pressure drop, high service flow rates and high bed loadings combined with lower backwash frequency allow economy in equipment downsizing and reduced pumping requirements. Its low density also saves on handling expense and shipping costs. Clack Filter-Ag Plus can be applied to systems designed for either pressure or gravity flow. Because of its unique physical characteristics, Filter-Ag Plus can be used to replace multimedia (graded density) filter designs. Air scour is possible and helpful when there is heavy loading in the bed. It has to be done minimally in order to prevent too much bed lift and/or advanced attrition. An air scour of 1 to 2 cfm/ft2 at backwash rates of 15 to 20 gpm/ft2 would be sufficient. The pressure required would be static head pressure plus the psi necessary to deliver 1 to 2 cfm/ft2 . Bed expansion should be observed to ensure that media is not being discharged in the back wash water. A one minute air scour at the beginning of the backwash cycle should be sufficient. Prolonged air scour may cause stratification of the smaller media to the top of the bed which could affect future head loss.